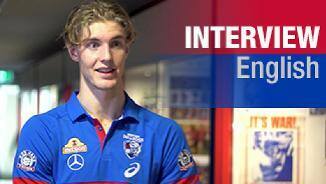 12 months on, Tim English has adjusted to life in Melbourne. westernbulldogs.com.au reviews Tim English's 2017 season. 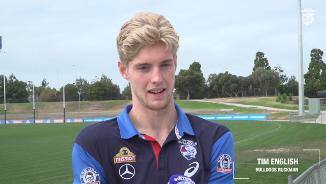 English: "Really looking forward to this year"
English was taken with the Western Bulldogs' first selection in the 2016 NAB AFL Draft, pick 19 overall and made his senior debut for the Club in Round 10 against St.Kilda. 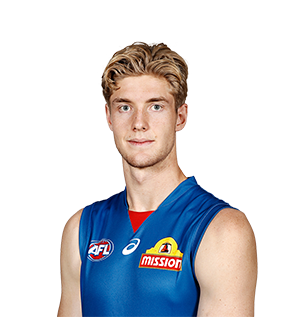 Cited as the most talented ruckman available in the 2016 draft pool by experts, the 205cm English boasts genuine midfield presence. 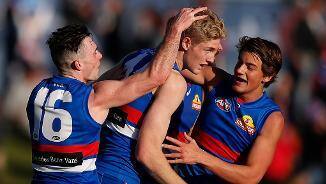 Agile and athletic, the 19-year-old West Australian impressed scouts with his ability to cover the ground and pick up possessions – he averaged 15.6 disposals and 22.8 hitouts per contest for the WAFL Colts according to Champion Data. A very good kick for his size, English also possesses exceptionally clean hands and his follow up from his ruck work is first class.